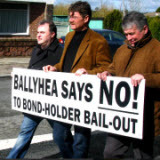 On Sunday Sept 3rd the Ballyhea Says No campaign took the road once again, our focus now on the Promissory Notes of 2009/10 when €31bn was gifted by our Central Bank to two insolvent institutions, Anglo Irish Bank (€25.5bn) and INBS (€5.5bn). The quid quo pro for the creation of those billions, which all three of the Central Bank, the government and the ECB knew would never be repaid by either Anglo or INBS (both of which were insolvent, is that the Central Bank of Ireland must take that €31bn back out of circulation. I'm asking people now to please, please, read that paragraph again, very carefully - our Central Bank is being forced by the ECB to destroy €31billion, billions that were used to bail out not just two insolvent Irish banks, but in fact to bail out the entire eurozone banking system, which the ECB feared - rightly - would have collapsed if those two banks had gone under. And now, read the following few paragraphs, then read them again if the enormity of what’s happening doesn’t sink in the first time. Because it’s critical that you understand that as part of the Anglo Irish Bank bailout legacy, our Central Bank is right now destroying borrowed billions, and doing so at an accelerating rate. That’s €14 billion destroyed by the Central Bank of Ireland since 2014, a further €3billion in 2011 - €17 billion in total, with another €14 billion still to go. And bear in mind - a billion euro is one thousand million euro, that's €1,000,000,000. This ongoing destruction of billions is a political choice. Rather than challenge the ECB on the illegitimacy, the illegality, the immorality of all this, rather than making the really hard choice, successive governments have caved in to the ECB and chosen the easier route for themselves. And so, year after year, our National Treasury Management Agency (NTMA) borrows billions for destruction, every cent of which will have to repaid at some stage in the future, on every cent of which we are now paying interest. Debt piled on legacy debt for future generations, when those billions could be used so constructively - think of our hospital crisis, our health crisis, our homelessness and lack of housing crisis, think of our underfunded water/roads/broadband infrastructure, then think what could be done with those billions. Over the past several years the NTMA has been building up something of a war chest – prudent, given that borrowing costs are now so low. However, rather than using those billions to invest in all those badly needed services, they’ve been redeeming the Promissory Note bonds from the Central Bank of Ireland, and they’ve been doing it a rate far faster than is called for in the new schedule. 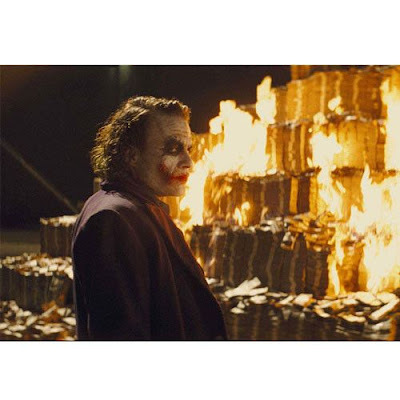 The NTMA gives the Central Bank of Ireland the borrowed billions in exchange for the Promissory Note bonds, the Central Bank of Ireland then destroys them, the ECB is satisfied. That is worth repeating and even stressing – the Central Bank of Ireland is destroying those borrowed billions. The above is not being reported by any Irish media. What is being reported is Fake News, partial truth in such as the Irish Times, which in fact presents all this almost as a 'good news' story - we're 'cancelling debt' at an unprecedented rate, no mention of the fact that we're destroying billions every year. Where is the outrage in our media, even the criticism? It could be down to the fact that in the main, and as we've seen exposed in the McCabe case, it has become over-reliant on government insider 'sources' for their stories and thus compliant when it comes to their reporting. It could be that it's too complex an issue for them to grasp. One of our goals is to change that mindset. The Ballyhea Says No campaign isn’t about finding fault for this entire Promissory Notes debacle, it’s about finding justice for Ireland. When the banking crisis hit the eurozone the fledgling currency was ill-equipped to deal with the fall-out, not a single support structure in place. Ireland shares responsibility with all the others in the eurozone for those design failures – we were party to that. But the eurozone shares a responsibility with Ireland for the cost of that failure. In the absence of a Banking Resolution Mechanism (now in place), the Promissory Notes were an emergency measure – almost a panic measure – to relieve a situation that threatened to bring down the entire eurozone banking system. The fear was that if one bank failed it would lead to a domino effect. In itself this was fair enough; that Ireland is now forced to carry the full Promissory Note cost of that euro design failure is not. And so, we’re back, unfinished business, on the road again in Ballyhea. We resumed on Sunday Sept 3rd 2017 and on the first Sunday of every month thereafter, at 10.30am, until we finally get bank-debt justice for Ireland, we will march. Because this is an injustice to us all, we’re looking for support, across-the-board support, from all political parties and Independents, from all media, from all of Ireland. We also have a new slogan - Ballyhea Says Know! Under the original schedule of destruction for the €31bn, the government had to destroy €3.1bn every year (March 31st the deadline). It happened in 2011 shortly after the new Fine Gael/Labour coalition government had been elected, under the radar, but of course it was totally unsustainable. In 2012 (€3.1bn) and 2013 (€25bn), under instructions from then Finance Minister Michael Noonan, the NTMA (National Treasury Management Agency, the institution charged with borrowing on behalf of the state) issued sovereign bonds to buy out the remaining Promissory Notes, all of which were immediately acquired by our Central Bank. So far, this was just a paper exercise. One state institution – NTMA – issued bonds which were held by another state institution, the Central Bank of Ireland. The NTMA was paying interest on those bonds to the Central Bank of Ireland which in turn was returned to the state exchequer – a circular arrangement, no cost to the state. As long as the CBI held those bonds this would be the case but of course this wouldn’t satisfy the ECB, who wanted to see that €31bn taken out of circulation. Along with the creation of those new Promissory Note bonds, a new schedule of destruction was also created. Rather than €3.1bn a year, the Central Bank of Ireland would sell those bonds at an initial rate of €500m a year for eight years, then gradually increase the rate until the entire €31bn was gone. v. The critical thing to know, however, is that the Irish people get absolutely no benefit from that €500m. AFTER IRISH WATER, WHAT NEXT?